Versa Court is a cost effective sports flooring material that comes in an array of colors, is easily installed on most solid level surfaces.Versacourt incorporates the most recent advancements in technology to ensure a comfortable, safe surface ideal for indoor and outdoor courts. The 3/4" thick shock absorbing suspended surface reduces playing fatigue, provides better ball rebound and exceptional game performance. 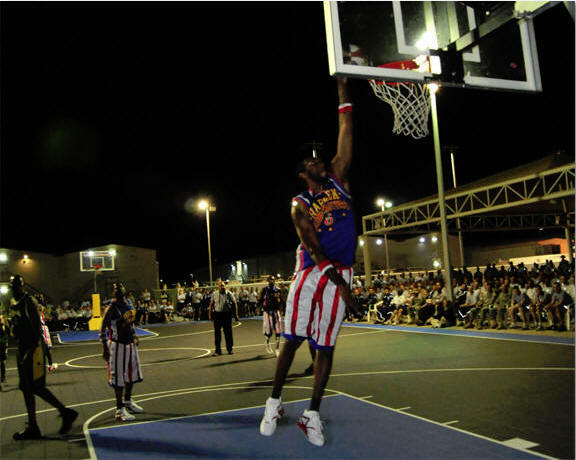 Click here to learn how to build your own backyard basketball court. Versa Court super grip surface design delivers an unequaled performance in game play allowing greater safety when jumping and turning in close proximity. The adsorbing nature of the Versa Court tile can reduce the impact from falls that might other wise produce significant injury. Add new dimensions to your back yard with a full or half court size layout. Our portable floor combines strength, beauty, and playability without the high cost of an installation crew. Do it yourself & save with a court diagram layout that's built just the right size for your backyard. 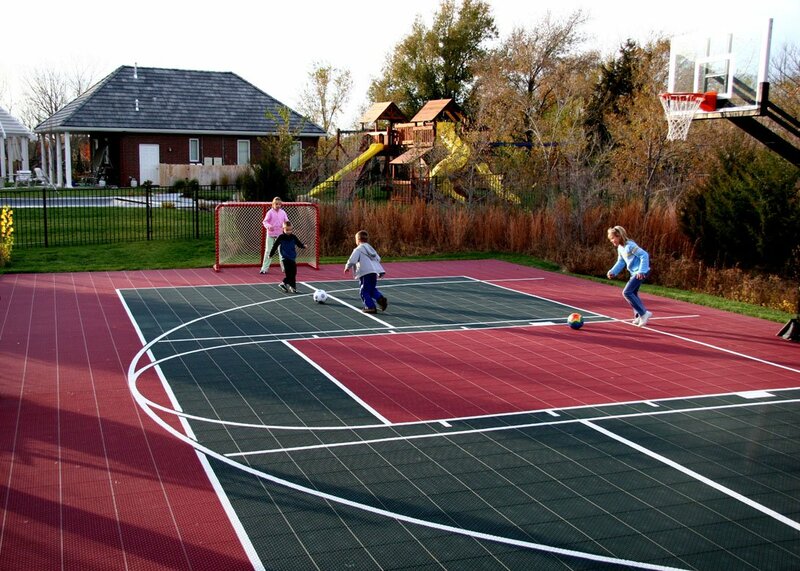 Basketball-Goals.com sells Versa Court tile and all the accessories you'll need to create your own backyard multi game court. All you'll need is a hard level subsurface such as a cement or asphalt slab. Simply snap together the Versa Court tiles add a hoop or use your existing one and your good to go! You'll love your new Versa Court court and you'll also love the money you'll save by doing it yourself. Let us show you how. Click here now for a quote, or call us directly at 860-426-1258. No more sweeping or sponging big water puddles. Rain quickly drains through the tennis and basketball court tiles allowing you to start playing quickly after rain stops. asphalt and concrete surfaces, thanks to Sport-Floor's engineered copolymer heat reflective materials. The expansion joints & spring tabbing mechanism between the basketball and tennis court tiles allow slight side-to side movement and forgiveness on joints and lower back. Sport-Floor's design also allows for a slight vertical give which takes additional pressure off of joints. Versa CourtPro tile have the most injection points of any game court tile on the market today. The 16 injection points insure better color consistency and provide for flatter, better performing tile. Our patented 6 point locking mechanism and Swiss-designed and manufactured 16 injection point tooling allow us to produce the flattest most uniform game court tiles on the market. This flatness and tight locking mechanism allow for the truest and most responsive ball bounce of any court tile available today. And our tile is made in the USA. Versa CourtPro?s new revolutionary locking mechanism uses six locking points on each 10? tile, more than any other tile on the market today. The tiles snap together effortlessly making installation a breeze. The six separate locking points keep the tile flat and secure to the floor allowing for a consistent uniform ball bounce. Versa CourtPro tiles feature a revolutionary reverse spring tension expansion joint that allows slight side-to-side movement giving our game court tile a firmer, yet more forgiving, lateral flexion than our competitors. 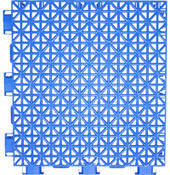 This spring tabbing mechanism in our tennis and basketball court tiles also provides for a greatly improved aesthetic appearance and playing surface by keeping the tile evenly spaced apart. 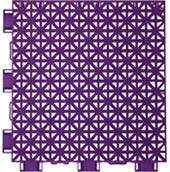 UV additives are molded into each tile to insure long term protection against color fade. Versa CourtPro incorporates up to 25% more UV additives than are commonly used in the industry. Versa Courtcarries a 15-Year limited warranty and a 25-30 year life expectancy. Maintenance is as simple as keeping leaves blown off and an occasional power washing to remove dust and dirt. The tiles are completely anti-microbial and will not build up mold like conventional court surfaces. The tile help hide cracks from the subsurface underneath and allow for many years of play without worry of crack and surface repair. Click here now for a quote , or call us directly at 860-426-1258. 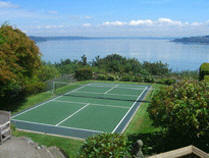 Click here to view our tennis court products. You'll love your new Versa Courtcourt and you'll also love the money you'll save by doing it yourself. Let us show you how. Click here now for a quote, or call us directly at 860-426-1258.